Starting off as someone very nervous on the road, Mert's calm and friendly approach was perfect for someone like me. 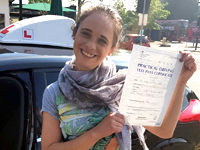 With the added pressure of being 7 months pregnant, Mert was fantastic at helping me plan my route to success with the intensive driving course. 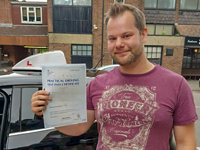 He made driving 4 hours a day a relaxing and enjoyable experience and built my confidence to be able to pass with just one minor! No information overload and great assistance in guiding me to trust my own driving instincts. Highly recommend and I plan to take my pass plus course with Mert as soon as the baby arrives! Mert is an amazing instructor and he helped me to achieve my driving skills to an excellent level. I passed with ZERO Minors under the instructions he provided which now means I get my freedom finally! I recommend Mert to anyone who is aiming to pass successfully. Just so you all know I chose Mert for my “Pass Plus” too knowing that he will be the best instructor who will help me to gain my confidence on motorways and country roads in different weather conditions. We even managed to have a driving lesson on ice! – you don’t get to practise that, do you? 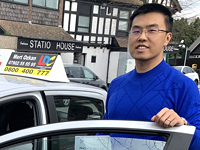 Absolutely fantastic instructor, very patient, extremely calm and friendly. Don’t worry when you doubt your skill as when you do mistake is not “your fault” is “our fault “ that’s what Mert always says – no blaming culture, no pointing mistake or lack of confident – This driving instructor concentrate only on making sure that you drive safe, you understand what is right and what is wrong and that you are making progress in your own pace gaining confidence which leads to getting your driving licence . I do Highly recommend Mert to anyone! I began my lessons with Mert as an extremely nervous non-driver. I had several negative experiences prior to starting, but I found Mert to be very calming & he quickly helped build my confidence. Suddenly I found myself actually enjoying the lessons, something I never thought would happen! Before a lesson, and with the help of the LD System, I was able to identify elements I wanted to concentrate on which gave me a sense of control over the process & helped me gain experience. I would highly recommend Mert as an instructor, he showed extreme patience & most of all had a sense of humour! Mert is a very experienced driving instructor. He taught me a lot of skills not just for passing the test. He explains things clearly and comprehensively. Overall I had very good learning experience so will definitely recommend to other people to take his lessons. First Time Pass with Mert! I was looking for an instructor who would be able to pick up my lessons from where I left over (which was years ago - never bothered to finish them). I came across Mert through another instructor who recommended me Mert. Right from my first lesson he understood how I learnt and what was the best teaching method for me. 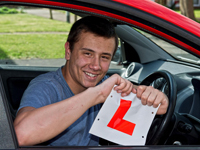 Can not recommend Mert enough - passed my test the FIRST time. Mert was absolutely fantastic as a instructor and more importantly he was realistic - told you how things were instead of inflating your ego. Having said that he was calm and dealt with any issues in a constructive way which I believe is the most effective approach. It was an absolute pleasure being taught by Mert and I would highly recommend him to anyone looking to start taking lessons. I was a very nervous student and the thought of driving a car made me extremely nervous. I had tried different instructors without much success of even getting off to a start on the first lesson. Having lost faith in the whole idea, Mert took me on and assured me that things aren't as doom and gloom as I had imagined. He ensured i was comfortable about it and took me through the process of learning at my own pace that i was comfortable with. He was professional and polite throughout. 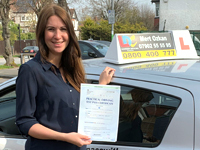 Mert had taken me from a very nervous learner to a confident driver. 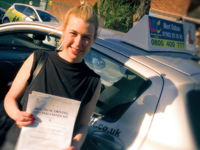 I have passed my test with very few driver faults and I feel happy and glad i chose to do my lessons with Mert. I would highly recommend him. Mert is a really good instructor. I learned from zero and felt more confident lesson after lesson. Mert was very professional, friendly and patient with me. I enjoyed my lessons and always felt calm. Today I feel ready for the roads and confident as a driver. I recommend Mert to every learner (beginner or advanced). I wouldn’t be here today without this teacher. Also, the lesson prices was honest and I never felt “stolen”. Again, I highly recommended Mert. Mert is a great instructor who helped me pass the first time. 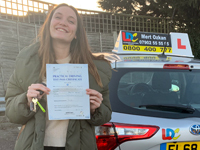 I already knew how to drive but Mert helped me iron out my bad habits and improved my road awareness as well as road safety in order to get me through my test successfully. Highly recommended. A Five Star Driving Instructor! As a 30 year old man that had no previous driving experience I was, understandably, anxious and sceptical about my driving abilities. Luckily, Mert was a fantastic instructor who put me at ease immediately. 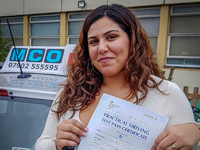 Mert is able to push you to perfect your driving skills quickly whilst also being considerate of areas that you may find stressful and challenging, thus allowing you to comfortably develop your driving. A personal example, was how challenging I initially found hill starts. Mert, repeatedly practised hill starts with me and was always considerate enough not to overly focus on it for a whole lesson. It’s nice to practice areas you need to improve for some of the lesson but after a while it becomes tiring; Mert always provided a nice balance of developing each of my skills to keep be positive and motivated through each lesson. Another important aspect for me was that I needed a reliable instructor. It’s important you can trust your instructor to turn up on time and not cancel at short notice, especially when working full time like myself. I did lessons with Safia after work and on weekends. Mert always give me plenty of warning on her availability so we could find a schedule that worked. I would happily recommend Mert as an instructor.